This instrument is based on an original 1616 Ioannes Ruckers double manual harpsichord using a drawing prepared by the Ruckers expert Grant O'Brien. The lower manual of this instrument originally had a compass of G-c''', probably the earliest known instrument with this fully chromatic range. Normally in Flanders as in Italy, keyboard instruments used a 'short octave' which leaves out some of the chromatic notes in the bass. But Ruckers were prepared to satisfy a demand in England and France for a fully chromatic bass. The upper manual originally played at a pitch transposed by a fourth, but the original of this instrument was later converted to a normal double manual, and it is this version on which this copy is based The treble is extended by a few notes, giving the range G-e'''. In the example shown there are 4 rows of jacks with a dogleg 8' register that plays from both keyboards, as well as independent 8' registers for each keyboard, and a 4' register on the lower manual. 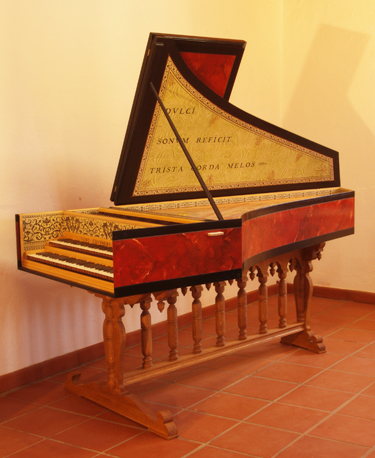 The instrument can alternatively be built with 3 registers and French style keyboard coupling.